1. Introduction – Race SoCal International Inc is the premier motocross vacation company in Southern California, it is our mission to provide you with easy affordable access to the local tracks and riding facilities. 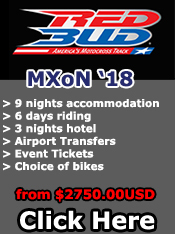 Our vacations include but are not limited to accommodation, bike hire, tours to motocross specific sites, event tickets for various national and international events and transport to/hotels for events that we attend out of our area. 2. Services we provide – Below is a list of the following services we provide for our clients: - Airport transfers to and from our local airports (usually LAX) - Accommodation with self-served breakfast - Bike Hire on CRF250/450 4 stroke motorcycles or YZ125/250 2 stroke motorcycles - Bike Hire includes track fees, fuel, pit support unless otherwise specified - Transportation for the group to use for evenings out, travel to the local shops etc - Tours to Troy Lee Designs, Pro Circuit and other motocross places of interest - Transport to and from out of town events we attend. - Event tickets for select events included in your package. - Hotels for out of town events included in your package. - We may also have merchandise and motorcycle aftermarket parts for sale at special rates. - No other products other than what is listed on your package itinerary are included in your trip unless otherwise stated by Race SoCal management. 3. 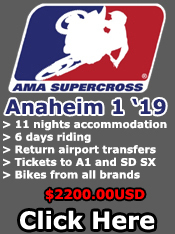 Enjoying your riding experience - We cater to amateur riders of average ability who wish to stay and ride in California and live the dream of riding the same tracks the top level pro’s ride. We encourage all customers to ride within their limits and remember they are here for the enjoyment of the experience. To maximize the enjoyment of your vacation please assess the track conditions, your ability and the equipment you are riding. Make sure you enter and exit the track in a safe manner and only attempt obstacle you feel safe and confident in doing. We understand motocross is a dangerous sport and some accidents are inevitable however we would like all of our clients to have an enjoyable time and to return home safe. We reserve the right to refuse service to anyone we deem unsafe to ride a motorcycle and anyone who may be a danger to themselves and others on the track. 4. Rider Injury Disclaimer: - Acknowledgement of the risks of motocross: By accepting these terms and conditions I/We understand that by taking part in this activity I/We are exposed to a risk of death/becoming permanently disabled/or suffer some other serious injury as I/We acknowledge that even in the event of negligence on the part of Race SoCal International Inc, Stephen Heighton, any company representative, the venue owner or any individual carrying out duties on their behalf were to a contributory cause of any serious injury will always be my/our decision to take part in a high risk activity. - Motorcycle Safety: By accepting these terms and conditions I confirm I am an experienced motocross rider and capable of enduring the safety of the machine and assessing my capability to ride any particular circuit. I confirm I will address the safety of any motorcycle before taking the motorcycle onto the circuit. - Damage to motorcycle: By accepting these terms and conditions I acknowledge that I am responsible for all damage caused to the motorcycle whilst under my control other than mechanic failure and wear and tear. In the event of damage, I agree to pay for or replace any damaged parts as per the price list attached. 5. Bike Damage Price List – you are responsible to pay for any crash damage you incur while riding one of our bikes. If you bend it you pay for it or replace it with an equal part. We carry many parts in stock and have a fabrication shop on site for minor tweaks and welds. If you crash we will keep the price of your repair as cheap as possible however the bike you are riding needs to be returned to a serviceable standard for the next customer. Please see the price list below for what we charge for damages. - Clutch Lever - $10 - Brake Lever - $10 - Handlebars - $75 - Bar Mount - $20 per mount - Radiator - $150 per side - Exhaust Head Pipe - $200 - Exhaust Tail Pipe - $250 - Sub Frame - $300 - 3 rd Party Labor (welding etc) - $50 per hour -You are also welcome to purchase the damaged parts yourself at the local bike shop and we will fit them. 6. House Damage Disclaimer – We ask all of our clients to treat our house like they would their own home. Our staff live on site with you 24/7 and if you are caught damaging our property you will be charged appropriately. Anyone refusing to pay for damage they have caused will not be riding the rest of the trip. Please help us look after our property and equipment so it is in a nice condition for the next guests and for when you come back in the future. 7. 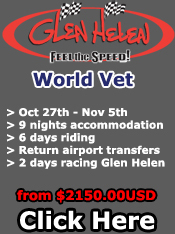 Payments – A 30% deposit is due at the time of booking to reserve your spot and your desired motorcycle for the trip. Your balance is due 14 days before your trip is due to start. We accept payment in forms of credit card and wire transfers. If we have not received your card details or wire transfer for your trip to be paid in full 14 days before you are due to arrive then we charge a $50 late fee. If you have not paid in full at the time you arrive you will not be riding on the first day until you have paid in full. If you are unable to pay your invoice will be assigned to our international debt collection firm that specializes in international recovery. We may also sell any and all bad debts to an international debt purchasing company once a debt is considered irrecoverable. 8. Cancellations – You may cancel your trip in writing at any time. All deposits and payments are final and non-refundable. If you do not cancel your trip before the final payment is due then we will proceed with the billing of your invoice and you will be responsible for the full amount. If you cancel within the appropriate time period and wish to reschedule for a different trip, all or some of your deposit/payments may be allocated against that trip’s balance at the discretion of the management. 9. Travel/Medical Insurance – We highly recommend all clients obtain travel and medical insurance. We recommend travel insurance for trip cancellation, lost luggage, change of flights etc. We recommend you look for a policy that includes medical cover for motorcycle riding, motocross, extreme sports or hazardous activities that does not exclude motocross. It is up to your to obtain a level of insurance you feel comfortable with – we recommend $500,000 in medical cover. 10. Minor Waiver – If the rider is under 18 and attending without their legal guardian a parental waiver must be signed prior to arrival. You can obtain this form by contacting our sales office sales@racesocal.com. 11. 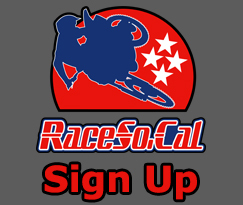 Customer Service – If you have any disputes regarding bookings, reservations, payments, incorrect invoicing or anything else of concern please contact our sales office at sales@racesocal.com and we will work with you to remedy any issues you may have. 12. Indemnification - To the fullest extent permitted by applicable law, you agree to indemnify and hold Race SoCal harmless from and against all damages, losses, and expenses of any kind (including reasonable attorney fees and costs) arising out of: (1) your breach of this Agreement; (2) any activity in which you engage on or through with Race SoCal; and (4) your violation of any law or the rights of a third party. Thank You for reading our Terms and Conditions – Please enjoy your motocross vacation to California.